Hello, my name is Weegee & Zomze! Male-Female (Small). Fox terrier. Senior - DOB: unknown . Weegee and Zom were both adopted from the Wetnose Animal Shelter around 6 or 7 years ago. Weegee had clearly been abused, as she refused to leave her new bed for 2 weeks after we got her, and Zom was on a farm with 20+ other dogs, and had been fairly badly neglected. They have grown up to become inseparable, brother and sister. They could not be more different from each other though. Weegee is incredibly gentle and loves being around people (especially ladies), chasing a ball and generally pottering around, whilst Zom is happy to do his own thing and curl up on anything soft in his quest for comfort. Weegee and Zom are both extremely loving, and are perfectly suited to being house-dogs. They prefer to go outside when nature calls, and will tell a person when that call is being made. They do not bite, bark only when there is something to bark at, and are generally extremely well behaved (I have taught them to respond to clicking fingers). Weegee and Zom would make excellent doggies for slightly older owners, as they aren’t puppies anymore, but a more loving pair you will not find. A bit more about this pair who are being homed due to emigration – they are both sterilized. They will have their vaccinations updated before homing. They are chipped. They are fantastic with children & other small dogs. They are good with domestic staff. 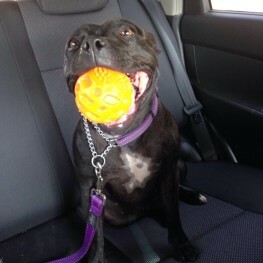 Weegee loves chasing balls, having snacks, cuddles, just being around people. Dislikes intimidating males. Zom love lying in the sun or on soft things, patrolling, being outside, snoozing. Dislikes having his bum touched.